The 2019 Cadillac XT4 is a compact, crossover SUV. This is a four-door vehicle with a rear hatch. It can seat up to five people. This is Cadillac's second entry into the crowded field of crossover vehicles. It was made smaller than its bigger XT5 predecessor to fill another niche among car buyers. As luxury sedans are less in demand than in years past, Cadillac needed to do something to stay in the game. Through the XT4, Cadillac brings its unique brand of style and luxury to the compact-crossover market. This is the debut year of the 2019 Cadillac XT4. It is based heavily on the XT5. The XT4 is shorter than the XT5 but still manages to seat the same amount of passengers. It shares the same 2/3 seat configuration as its bigger brother. Some parts of the interior are actually more spacious than what the XT5 offers. Cadillac still managed to cram a lot of cargo space in the XT4 too. The new engine that powers the XT4 is a turbocharged, 2.0 liter, inline-4 cylinder. It's a smooth running and peppy engine that cranks out 237 hp. It can also produce an impressive 258 lb-ft of torque. The engine is well engineered as evidenced by its quiet operation. Acceleration is great in the XT4. You can get up to 60 mph in approximately 7 seconds. This engine is paired with a 9-speed, automatic-transmission system. The transmission system works wonderfully with smooth and accurate shifts. 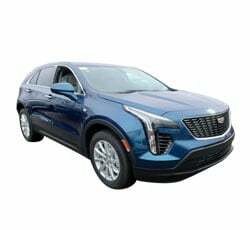 The 2019 Cadillac XT4 offers great steering and handling. A sport mode causes the transmission to shift at different points. This gives the XT4 a more sporty feel while driving. Steering is tight and accurate. Handling is at its best with an AWD model, which really hugs the road. A small turning radius makes this crossover easy to maneuver. The XT4 is more fun to drive than any compact crossover has a right to be. You can opt for FWD or AWD on the new Cadillac XT4. AWD is excellent form some light-duty, off-road action. It also makes the car a better performer with better traction. If you need to drive over wet or slick roads, the AWD makes the XT4 a safer vehicle. The 2019 Cadillac XT4 is a compact car with a lot of legroom. When it comes to the rear-seat area, many compact cars will feel a bit cramped. That's not the case for the XT4. It has more room to stretch your legs out than any other crossover in its class. Cargo space is often the main reason why drivers prefer an SUV over other vehicles. A compact crossover provides the cargo space while remaining as a manageable, car-sized vehicle. The XT4 gives you 22.3 cubic-feet of space behind the rear seats. When the seats are properly configured, you can extend that amount to a whopping 48.9 cubic-feet of cargo space. The 2019 Cadillac XT4 can seat up to five adults. The rear seats are actually very comfortable. They should be fine for most average-sized adults. They work even better for transporting children. Having the extra passenger space is one of the best perks of owning a crossover SUV. If you like to travel with an entourage or just have a big family, the XT4 has you covered. One of the top reasons to buy a Cadillac is their impeccable style and luxurious interiors. The front seats in the XT4 rival the best home recliners for comfort. They're large, supportive and cozy. They're perfect for long commutes and road trips. The upholstery and stitching is of the highest quality. You can get leather trim and there is wood and chrome accents throughout the cabin. The gauge cluster is attractive and well designed. Cadillac gives you a ton of luxury options such as heated seats. The 2019 Cadillac XT4 packs in a lot of features to keep you and your passengers safe. There are a bunch of driver-assist systems. The high-strength steel frame and 8 standard airbags keep you safer in the event of a collision. A rear-view camera helps you to avoid collisions while in reverse. Sensors on the vehicle give you ample warning of objects and vehicles from all sides. In addition to standard warning lights and sounds, you even get subtle vibrations and feedback from the driver's seat. The Cadillac XT4 has one of the best fuel-economy ratings in its class. In EPA tests, the XT4 got up to 30 mpg during highway driving. It got up to 24 mpg while driving around in the city. This crossover will save you plenty of money on fuel in the long run. The 2019 Cadillac XT4 provides an amazing sound system by Bose. There are different levels of the sound system, but even the base package is amazing. A navigation system lets you find your destinations with ease. You can connect your smart devices through a variety of USB ports, Bluetooth and other options. Cadillac has full connectivity with Apple's CarPlay and Android Auto too. A large, HD touchscreen gives you all of the information you need at a quick glance. Voice commands give you control over most functions while freeing up your hands to keep hold of the steering wheel. Steering, handling and braking feel great in the Cadillac XT4. It can even take a sharp turn at a rather high speed. Unfortunately, you will feel quite a bit of body roll when you do so. It's more noticeable that it should be. Still, not everyone is going to be taking turns at high speeds in a compact crossover. If you're not often on constantly-winding roads, this may not matter to you. The 2019 Cadillac XT4 offers a towing package. It can boost your towing capacity up to 3,500 pounds. This isn't bad by any means. It may even be enough or more than you'll ever need. It's just something to be aware of if you will be doing a lot of towing. There are other alternatives in this class and price range that can tow a lot more. If there's one real weakness for this excellent crossover, it's the lack of standard features. There are luxury features, safety features and high-tech options galore. Unfortunately, none of the good stuff comes standard on the base model. You'll have to dish out more of your hard-earned money to get all of those bells and whistles. This can quickly turn an economic purchase into something expensive. In the very crowded field of compact crossovers, the 2019 Cadillac XT4 stands out by being a luxury vehicle too. When seeing how it stacks up to the competition, it's only fair to compare it to other luxury crossovers. Its top competition comes from the BMW X3, the Audi Q5 and the Lexus NX 300. The BMW X3 offers a bit more cargo space than the Cadillac XT4. It also gives you a slightly higher towing capacity. These are very minor differences and in most aspects, the two vehicles are very similar. The Cadillac comes out ahead by being the less expensive of the two. It's just a better value for your money. The Audi Q5 gives you more standard features than the XT4. This is the one area in which the Cadillac is lacking. Performance, steering and handling are pretty equal between these two crossovers. The XT4 is once again the lower-priced vehicle and the better value. It provides a better ride quality than the Audi too. The Lexus NX 300 carries a price tag that is nearly the same as that of the Cadillac XT4. Both vehicles offer luxurious, impressive interiors. The horsepower and torque ratings are virtually identical between these two crossovers. The Cadillac is better for towing if you choose the towing package. It also gives you more space for the rear-seat area. The Cadillac offers a better infotainment system with more connectivity options. The 2019 Cadillac XT4 is a fantastic, compact-crossover SUV. It's easy to recommend this vehicle to anyone looking for a new crossover. It does everything well. The few negatives that we've covered almost feel like nitpicking. The comfortable interior and overall ride quality are a dream. This is a vehicle that you'll want to take long drives in. The exterior and interior styling is beautiful and elegant. It comes in at a great price and offers great fuel economy too. If you need something luxurious and practical, it doesn't get much better than the XT4.